Here are a few of the nice comments that I have received regarding our Super Spotter Scope Stand and our peripheral products. I wanted to let you know my experience with the Super Spotting Scope Stand at the range was absolutely incredible. I’ve never been a particularly good spotter but Thursday was entirely different. The Stand is so stable and easy to use, I was seeing bullet trails and calling shots when other spotters couldn’t, even with better glass. I have a pretty good Leupold scope but struggled with my old tripod. Even in a stiff wind, I’m now able to provide good information to shooters. My friends were impressed, indeed, and it’s nice being a spotter my shooting partners can trust. Thank you again for a great product. Wayne…just received the shooting stand and I am blown away by the sturdiness and quality. I cannot wait to get to the range and into the real world to stretch it’s legs. I cannot tell you how much I appreciate the ball/rod which you so kindly included for my “patience”. It has been a long time since someone did more than called for in my behalf. The fellows at the range will surely be getting “clued in” on this . Thank you very much for getting the stand to me on Thursday. I appreciate it very much. I’ve used a variety of stands during my competitive marksmanship tenure, everything from a Freeland Tripod, Bipod, Ewing (regular and Tactical), Giraurd, even a Ray-Vin. Your stand is the most stable of any that I’ve tried. Shot with her the first time today and we won the Midwest Palma Team Championship. I think she is Good Luck! I love this scope stand. MAN is it SOLID… Had a few guys checking it out, they were impressed with your rods and the way the scope moves under tension with the o-ring. Anyone that asks I tell them about how you stand behind your product with the lifetime guarantee. Can’t say enough good things about it. Hi Wayne, the (custom) base came today. As I expected, it is one awesome base and exactly what I wanted. Now this is a perfect stand and would be hard to improve upon. You went beyond expectation with your nice touches. The plastic threaded cap that hid the set screw for the leg bolt is a nice touch. It also acts as a cushion when I set the base on the concrete with the legs folded up preventing damage to the bottom of the base. The set screw you installed on the leg bolt is smart to prevent the bolts from backing out. My Creedmoore has this issue. The more you deploy and stow the legs the more likely the leg bolts are to move. Posted on the CMP forums http://forums.thecmp.org/showthread.php?t=121422 Thanks again Wayne for working with me on this stand. 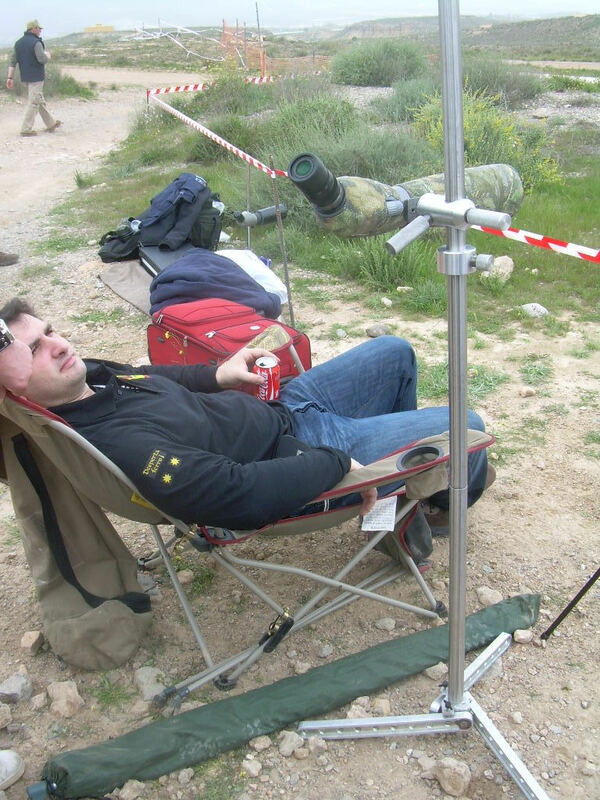 Here is one of my Spanish friends waiting for his relay to fire an F Class match, near Barcelona, Spain. Pablo chose the Stop Collar and the Leveling Kit options. (That is not Pablo in the picture).